is the extraordinary new Comau robot with a payload of 7kg and a maximum horizontal reach of 1400mm. The robot, designed and built with the most modern technology and with an obsessive attention to detail, is the result of an intensive design process a study of forms. The latest Comau creation features compact dimensions, outstanding performance and thanks to lower ratios and an innovative software approach is the world's fastest robot in its class. Ideal for applications where speed and accuracy are essential requirements, RACER ensures a significant reduction in cycle time for maximum performance! Founded in 1973 and headquartered in La Roche-sur-Yon (France), Sepro Robotique was one of the first companies in the world to develop Cartesian beam robots for injection-molding machines. 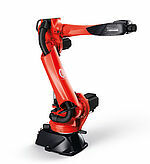 Today, Sepro is among the largest independent sellers of Cartesian and articulated-arm robots, having equipped more than 25,000 injection-molding machines. Sepro is also the largest robot supplier to the automotive industry in Europe and North America. Customers around the world are supported by wholly-owned daughter companies, direct sales and service offices, independent distributors that extend Sepro’s global network to over 40 countries. 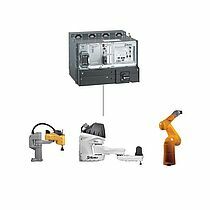 uniVAL drive is a “ready to plug” solution to drive Stäubli’s entire range of 4 and 6 axis robots with generic industrial multi-axis controllers. uniVAL drive remarkably eases the integration of Stäubli robots and makes the procedure simpler and faster than ever before – saving time, costs and resources.